The Madigas are one of the major families of dalit castes widely spread across South India, in Andhra Pradesh, Karnataka and northern Tamil Nadu particularly. Like the Chamars of the North, their traditional specialisation in leather work was the foundation for their expansion over the centuries. It was also the source of their distinctive Untouchability, rarely questioned before it was outlawed in the mid 20th century. As they became officially ‘Scheduled Castes’ and were, along with other sufferers, hedged around with legal protections and positive discrimination, some of their disadvantages began patchily and intermittently to reduce. Most Madigas remained trapped, however, in poverty. Declining dependence on leather across rural society was losing them the protected - if limiting - economic niche on which they had previously been able to depend. It had allowed them, despite fierce social discrimination, to establish and to continue to develop a distinctive and in a real sense rich cultural heritage. It is the purpose of this book first to excavate the existing though scattered research, mostly by others, then to place it together with their own creative literature so as to display the evidence from which this heritage can begin to be better understood. It is first and foremost for Madigas to understand and to use as they struggle through their own creative action to win for themselves the respectful attention that they deserve. Such struggles are of wide concern and interest today as dalit castes assume a new significance in Indian society as a whole, and indeed beyond. 20th century expectations that the caste system and the distinct identities embraced within it would soon in the course of development disappear – emphatically, that they should do so – have proved unrealistic. As a system, caste has long been changing. Of this there is no doubt: the Madiga record presented here is of change in progress. The kinds of change through the colonial and early independent periods are matters of great current debate, and the collection here contributes essential but often not readily accessible evidence for it. Of most direct and practical importance however is its bearing on castes themselves and their relevance for members in their personal lives as well as, in the political process, as a basis for recruitment. Caste identity has come to be seen by many as a key resource to be cherished and developed through proclamation and organisation, rather than as an encumbrance to be hidden or, in so far as it is possible, shed. By the end of the 20th century, what was most surprising was that even castes such as the Madigas, once Untouchable and expected to have most to gain by escaping their former identities, had joined the broadening mainstream of caste assertion and promotion. Reservation based on caste is the Indian form of positive discrimination or affirmative action. It was pioneered for Untouchables and subsequently extended for other disadvantaged groups. Today, debates over issues of further expansion or limitation of reservation rage fiercely. Abroad, the persisting plight of Untouchables features strongly in the international Human Rights agenda. That these people are and apparently always have been victims of the social order has become known across the world. For Madigas it is documented from the thirteenth century at least (Rao 1990). That they are much more than the outcast victims of society has been far less understood either at home or abroad. As major contributors to culture and society in their own right, paradigmatic examples such as the Madiga leather workers have remained hidden from most behind a screen of denigratory assumption and generalisation. Without penetrating the screen, only impoverished and significantly misleading conceptions both of caste society in the past and of what is happening to it today are possible. It is this wider concern and the enterprises of research and dissemination which it generates that give the exploration of the Madiga heritage significance not only for Madigas, though they remain the major stakeholders. It is significant for the vast audience of those concerned with Indian society and its entangled past, its present full of new opportunities and deeply rooted problems and concerned, above all, for its future. The collection to be presented here begins with a focus on the spectacular Dandora movement in Andhra Pradesh, asserting Madiga identity at the end of the 20th century in the cause of a fairer distribution of reservation benefits for themselves and for others. It moves on in Part 1 to set out evidence first of Madiga achievements and contributions outside the confining structures of village dominance, moving across the varied circumstances and regions of Madiga life, past and recent, in Karnataka as well as in Andra Pradesh. The focuses here are, beyond material production, on social, cultural and religious activity. They are the aspects of life which provide positive perspectives for Madigas themselves and for others. The roots of Madiga identity are the starting point here, examining them as they are still being proclaimed into the new century in ‘traditional’ performance of caste myth, as well as in the political campaigning already noted. 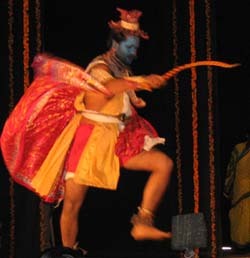 The record of their arts follow, beginning with their contributions to literature and continuing with their conspicuous and developing presence over a long period in the performing arts – instrumental, dance and theatrical – that are strongly developed in the grassroots society of this wide region. Studies follow of the organisation of Madiga life in families and in the caste more widely, and of their distinctive roles in trans-village religion. These topics of Part 1 provide the grounding in depth for its final chapter which returns to Dandora via the record of the mobilising for caste advancement that led up to it. Part 2, entitled ‘The caste-in-village trap’, brings together evidence throwing light on that other side of life that Madigas shared with most Indians in the past and still largely do today with other still rural people, as parts of structured village and small town communities. They shared it but, located as they have been amongst the most discriminated against and exploited sections, for them their place of abode and livelihood has also been a trap. Aspects of this and of attempts to escape and their consequences are explored in the four chapters of this part. The first, ‘The village order’, provides the main basis here. Substantial extracts from studies of Madigas in their local contexts range across time and space, from the late 19th century to the late 20th, in Coastal Andhra, Telangana and in Karnataka. They provide provocatively contrasting views of entrapped Madigas and highlight variation and change, the major themes of this collection as a whole. They also explore Madiga contributions to the busy religious round of their localities. In the following chapter, the readings investigate further the long-running theme of Mala-Madiga rivalry, present throughout the collection. Evidence of earlier anti-caste movements, including conversion to Christianity, is next examined, leading into the final chapter of the Part, on conflict with dominant castes and the sad and continuing record of atrocities against Madigas and other former Untouchables. The Conclusion takes up the issue of Madigas as Dalits. Solidarity with Malas and others in the dalit movement strenghtened in response to the horrific killing of Madigas in 1985 in the prosperous village of Karamchedu in Coastal Andhra, seen in the preceding chapter. Since the rise of the Dandora movement this solidarity has been severely undermined in practice though not by Madiga intention. Whether it is now to founder irreversibly on the reef of caste assertion, or whether solidarity can be restored on a basis that is firmer because fairer, is the underlying question as the Madiga future is finally discussed. Sources of the previously published writing appearing on this site are identified. These texts are shown in Times New Roman font. Copyright where applicable must be respected. Where it is not shown, no infringement is intended and Simon Charsley should be notified of any claims without delay. New editorial matter is shown, like this, in Ariel font. Copyright is not reserved but plagiarism should be avoided. In any further use made, please cite this editorial material as well as the republished sources. The wide variety of sources and the different regions from which they come mean that spellings and conventions cannot be standardised. The editorial notes inserted - [a], [b] etc. - draw attention to some of the major differences, as well as to many other often interesting matters. Where diacritic marks giving a better indication of spellings and pronunciations in Telugu are available in the sources they have been followed, except that dotted diacritics have not generally been possible. This also means that apologies have to be made to those who do not have the fonts on their browsers to show them correctly.